Leia Anne Dambrauskas was born April 7, 2014 and will soon be celebrating her 5th birthday. She is a kind and loving little girl who always has a smile on her face. Leia enjoys swimming, loves to play dress up and spiderman is her FAVORITE superhero (I mean….can you blame her?). On February 21, 2019 - Leia was diagnosed with T-Cell ALL and AML leukemia. This came as a shock to both her parents and older sister, Jayda. However, despite all of this - Leia has had a smile on her face through it all. Since her diagnosis she has undergone extensive surgeries and treatments and is currently awaiting a bone marrow transplant. She is responding very well to chemotherapy/treatment and has had more good days than bad days! She misses her friends at school the most and is anxiously anticipating the warmer weather so she can get outside to play! For the time being Leia is unable to visit any public places as her immune system is gone and she simply would not be able to fight off any illness’ or bacteria she could potentially pick up. Recently, her mother had to quit her job in order to be there for Jayda and Leia’s every need. 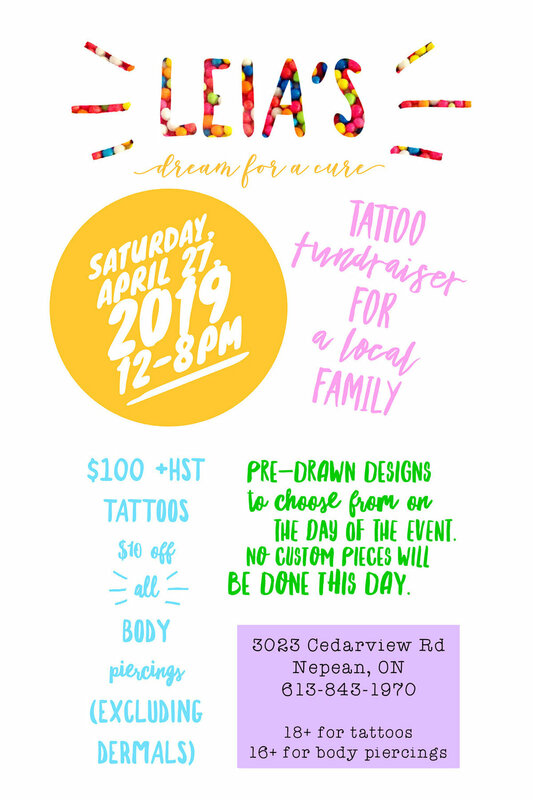 Financial stresses are hard on ANY young family but; we at Sacred Ink are hosting a tattoo fundraiser day in Leia’s honor to help take some off the weight off of their shoulders! Our goal is to raise enough money for Leia and her family to help cover the cost of some medical bills as well as other expenses. We will be donating 50% of all proceeds from both tattoo’s and body piercings done on the day of the event to the Nicolas-Dambrauskas family. We will also be accepting cash donations for the CHEO foundation directly here at the studio on the day of the event!